Puerto Rican Tody is commonly known as “San Pedrito” and it is endemic to Puerto Rico. Adult male has bright green upperparts. On the wings, we can see A small blue carpal patch. Flight feathers are bordered with dark blue-grey. Green tail is also tipped with dark grey. On the underparts, chin and throat are red. Breast is white, sometimes washed or streaked with grey. Belly and flanks are yellow. Undertail is dark blue-grey. Head is bright green, with whitish malar stripe and some grey feathers on lower cheeks. Long, thin bill has black upper mandible, and red lower mandible. Eyes are slaty-grey. Legs and feet are reddish-brown. 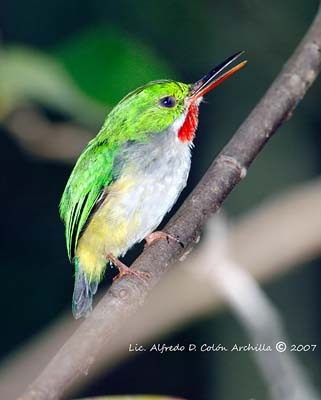 Puerto Rico Tody makes loud, nasal “beep”. It also utters raspy calls “neeet” or “prrrrrreeet”. This bird produces rattling sounds with the wings when it performs short flights. Puerto Rican Tody may live in varied kinds of habitats, such as rainforests, woodlands, wet forests at high elevation, arid scrub, dense thickets, shaded coffee plantations, and often near watercourses. It can be found from sea level to mountains. 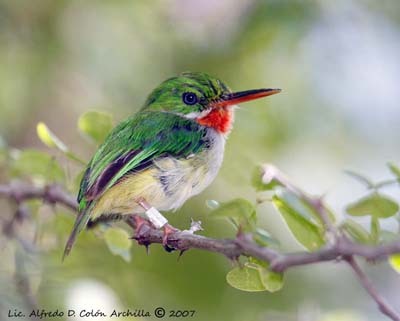 Puerto Rican Tody lives in Puerto Rico. Puerto Rican Tody feeds mainly on wide range of insects. It is very active and voracious, feeding constantly each minute of the day by flycatching. The bird sallies out from a perch, for capturing insects on leaves, twigs or in flight. Then, it alights on other perch in light movement. Between sallies, it sits motionless among the foliage. Puerto Rican Tody, as hummingbirds, is able to lower metabolism and temperature, in order to conserve energy when it cannot feed, when sleeping, or during long periods of heavy rains. It maintains basic body temperature with little variation. Puerto Rican Tody is territorial, but it can join mixed flocks of migrant Parulidae in spring and autumn. Todies are monogamous. Courtship displays include chases between mates, in straight lines or in arcs or circles, weaving among foliage. These chases can result in body contacts and also tumbles. When perched, Todies are agitated, hopping and bobbing rapidly with fluffed plumage. Courtship feeding can occur before copulation, but also during nesting period, in order to strengthen pair bonds. Puerto Rican Tody is not gregarious, and it is often seen in pairs on individual breeding territories where they remain all year round. Puerto Rican Tody performs flycatching for capturing insects, making short and rapid darts to catch them, and aerial sallies from perches. Todies have short, rounded wings, in accord with their small territories and feeding behaviour. Puerto Rican Tody nests in burrows. Both sexes excavate long burrow in bank, of 25 to 35 cm in length. Tunnel is horizontal, with terminal chamber after a curve. This chamber is unlined. The entrance, almost circular, sizes about 3 to 6 cm x 3 to 4 cm. Burrow is excavated in earth bank. Burrow is excavated from February to June, before wet season, and new tunnel is dug each year, requiring about 8 weeks of work. 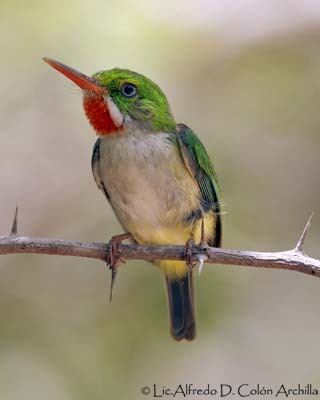 Puerto Rican Tody excavates with its long, strong bill, used as chisel. Then, the bird scrapes out the earth with its feet. During these works, male and female keep contact by low sounds. Female lays 1 to 4 glossy white eggs, between March and July. Incubation lasts about 21 to 22 days, by both parents. Altricial chicks remain at nest during 19 to 20 days, and they are fed by both adults with great quantities of insects. Parents can be helped by one or two other adults during incubation and nesting period, and nests with helpers can contain more eggs, up to 9 sometimes. Youngs fledge about 20 days after hatching. They have short bill and grey throat. They are fed for 3 weeks more and they need about 42 days to reach adult morphology. Usually, this species produces only one brood per year. Puerto Rican Tody feeds mainly on insects such as mantises, bees, wasps, ants, grasshoppers, crickets, beetles, bugs, moths, butterflies, dragonflies, flies, and also spiders. It occasionally takes small lizards. It can complete the chick diet with fruits. 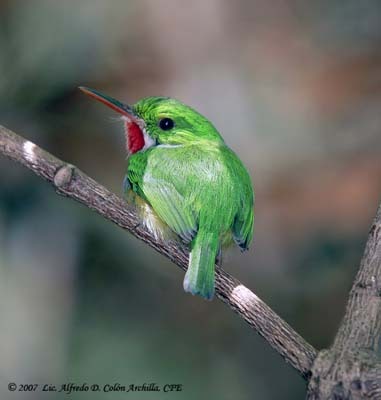 Puerto Rican Tody lives in restricted range, but its populations are not globally threatened. It is common and widespread in its range. Both sexes are similar, but female has more indistinct carpal patch and white eyes. Juvenile is duller with pale grey throat and yellowish belly. Bill is shorter. Juvenile needs 4 steps each of 3 weeks, for reaching adult plumage. Bill grows, throat turns pink, and then red, belly becomes paler and flanks become yellow.